Intuitive Surgical, Inc. Ups Its Buyback Program. Does It Matter? Probably not as much as shareholders would have hoped. While shares of Intuitive Surgical (NASDAQ:ISRG) have fallen about 7% since the election of Donald Trump, the past two years have actually treated shareholders quite well. Since bottoming out in mid-2014, the company's stock has advanced 80%. And yet, management clearly thinks that the stock is a steal: It recently increased its buyback program from $1 billion to $3 billion. While that doesn't mean all that cash will be spent immediately, it does mean that the share count should be moderating or heading south. Below, I'll discuss what this program means, and why it matters to shareholders. To put it simply, Intuitive Surgical has become a cash cow. While the past few decades were spent reinvesting in the business, the success of the company's daVinci Xi machine and platform -- along with hernia operations emerging as a major driver of growth -- has changed things quickly. Since bottoming out in 2014 when hospitals were tightening their budgets for the implementation of the Affordable Care Act, look at how Intuitive's stash cash has grown. Keep in mind that all of that change -- from $2.5 billion to $4.6 billion -- occurred in less than two years! It wasn't until this year that analysts rightly started asking what the company planned to do with its cash. Both the company's CEO, Dr. Gary Guthart, and its CFO, Marshall Mohr, have said that they would carefully consider all options, including increasing research and development, acquiring promising new companies, and returning the money to shareholders. Prior to this week, Intuitive Surgical had a $1 billion share repurchase program that had been in place since early 2015. The decision to increase the repurchase by $2 billion signals to me that this is what management sees as the best avenue for returning value to shareholders. In the end, exercising this full option to repurchase shares would cut the company's cash hoard by about 50%. I wouldn't expect any other flashy moves to be announced regarding this newfound wealth anytime soon. Here's the tricky thing about that buyback plan: It might not add quite as much value as hoped. 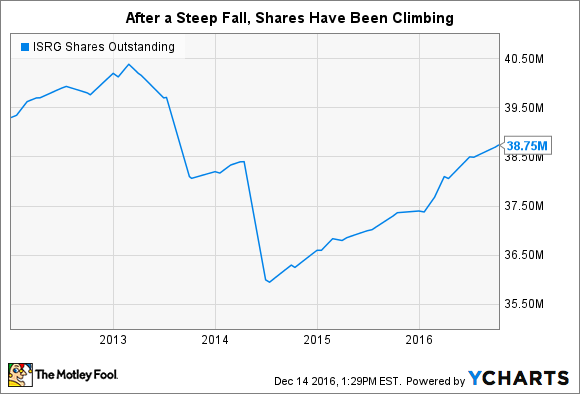 That's because since July 2014, the number of shares outstanding has increased from roughly 36 million to 38.75 million. Most of this is because of stock-based rewards granted to employees. ISRG Shares Outstanding data by YCharts. If the entire repurchase program were completed at once (which it won't be), it would retire about 4.7 million shares. That would increase the value of every share of the company by about 12%. That's not a small amount, and the number goes directly to the bottom line as EPS instantly increases. But we have to weigh that amount against the typical stock-based bonuses that are granted. Over the past nine quarters, shares have been diluted by just under 1% per quarter. In the end, that means that if the repurchase is completed within the next two years, the net result would be a reduction by about 2.25 million shares. At the end of the day, that means that each share's value increases about 6%. While shareholders would probably like to have seen a more substantive use for the cash, it's no doubt nice to see that it will be flowing to the bottom line over the next few years.